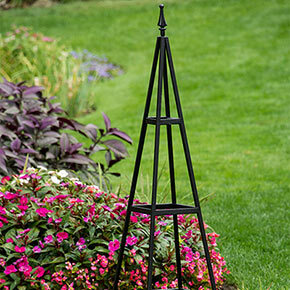 Put your vining perennials front and center with our exclusive French Country Tuteur. 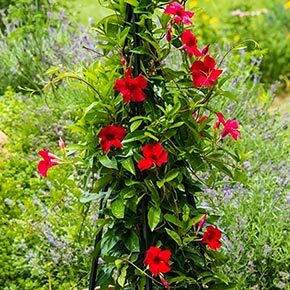 Inspired by the 'potager' garden style of France, our architectural piece provides a sturdy support for flowering vines both large and small without being obtrusive or overbearing. 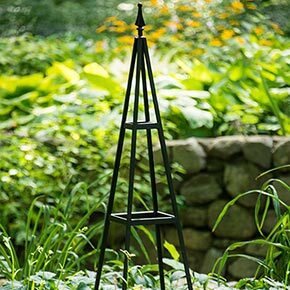 Its simple design and black powder coat finish create an appealing aesthetic as a stand-alone architectural piece, as well. Ideal for use as a landscape focal point, stationed at the corner of a mixed perennial bed, or even in pots 16" and larger. 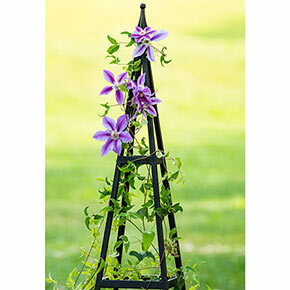 You can even use this beautiful support to show off prized tomatoes, squash and cucumbers in the vegetable garden. Order two and use them to flank a walkway or entrance. Minor assembly required. H52"xW14"xD14".